As part of my ongoing series on those who have searched for Franklin, I thought I'd take this occasion to speak with Margaret Bertulli, who was one of the first professional archaelogists to do work on the western shores of King William Island in the 1990's. These days, she's retired but far from inactive -- indeed, she'll be serving as one of the resident experts on Crystal Cruise Lines' upcoming Northwest Passage voyage, which will be the first to bring a large-size cruise vessel through this route. I reached her at her home in Winnipeg. Tell us, what brought you to the search for Franklin? In the early 1990s when I was the Arctic Archaeologist at the Prince of Wales Northern Heritage Centre in Yellowknife, Barry Ranford, a school teacher from southern Ontario and his colleague discovered a site with human remains on their trek down the west coast of King William Island. It was very dramatic as skulls and parts of infracranial skeletons were scattered across the ground surface of a small tidal island in Erebus Bay. Mr. Ranford had long been a Franklin enthusiast and this find was the first in decades with the potential to reveal more information about the fate of the Franklin Expedition. Mr. Ranford contacted the Heritage Centre and we organized a project for the following summer to conduct archaeological excavation and physical analysis of the human remains. Dr. Anne Keenleyside was the physical anthropologist who accompanied this project and analysed the skeletal remains. As the archaeologist in charge of the project, I prepared all of the logistics and conducted the excavation. It was particularly interesting for me to hear Mr. Ranford describe how he put himself in the frame of mind of the survivors as he walked along the low-lying terrain of western KWI, imagining himself in their footsteps and looking for Franklin-related items. He found at least two sites in this way. I remember flying on a Polar Continental Shelf Project Twin Otter from Resolute Bay to the site on KWI. Looking out the plane’s window, I marvelled at the myriad lakes and how desolate the terrain seemed. I began to understand a little about how these British sailors could have felt in this landscape. ‘Desolate’ is not generally a word I use to describe the Arctic because to my mind it is beautiful and full of wonders but, in this case, I could empathise with men far from home and longing to return. When you first arrived at the NgLj-2 site, what were your impressions? The bones, of course, have been the subject of much discussion, but I'd be especially interested in your thoughts on some of the other material artifacts --pipe bowls, buckles, glass fragments, buttons, and such. What do you think this site and those near it represent? It was a sunny mid-afternoon when we arrived. The Twin Otter blew a tire on landing and Mr. Ranford showed the pilot and co-pilot around the site. After that the pilots retired to the aircraft to await the arrival of another plane carrying a spare for them. I was glad to arrive at our destination and know the exact location of the site as Mr. Ranford had not been willing to disclose this information, concerned that others would pre-empt his discovery. In the midst of unloading our supplies from the Twin Otter, setting up tents and radio contact with Polar Shelf, it was some time until I could walk across the tidal flats from our camp to the small island. The area is very pretty with valiant little flowers and a huge celestial dome; one could see approaching weather long before it arrived at our camp. The artifacts that we recovered from surface collection and limited excavation that summer were very fragmented. They were really only bits of bits of artifacts and yet some provided information about how the men prepared for this journey; for example, the fragments of copper gauze and a partial lens of purple glass indicate that they probably used these materials to make goggles to protect against snow blindness. (I have never experienced that myself but did over-expose my eyes to the Arctic sun one afternoon on Devon Island and can tell you that it was painful—I wore sunglasses even indoors for the next few days.) 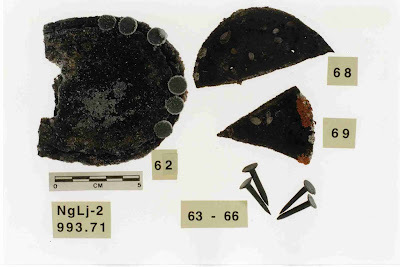 One particularly poignant find consisted of cut shoe heels through which copper tacks have been driven so that the points of the tacks would protrude through the heel and provide the wearer with purchase on the ice and snow. Any material of value had long since been recruited to new purpose by Inuit who had visited the area. I know that you've returned several times to the western coast of King William Island, investigating other possible Franklin sites. Do you think it's probable that there might still be undiscovered sites of significance in this area? I’ve been on field projects on KWI in 1993 for the excavation of NgLj-2 and to Cape Felix in 1995. I think it is highly probable that there may yet be more sites. Unless one has been there, it is difficult to appreciate how the terrain effects what one sees on the ground surface. It is easy to walk within several feet of a find or artifact and not see it as the ground is covered with shattered limestone slabs about the size of dinner plates so that one must be careful with one’s footing. Many of the objects are small and not highly visible. The low-lying terrain fosters very poor drainage so that in some years previously dry areas may be water-covered. Of course, a helicopter would be a useful yet expensive way to conduct survey. What other sites on land would, in your view, be the most promising for additional archaeological work? One can return to the same site for multiple years and always find something new or re-interpret evidence and ideas so the area around Erebus Bay would be a likely place to recover further information. I think that Terror Bay could also be explored systematically. Do you think it would be worthwhile to revisit Starvation Cove or perhaps the Todd Islets/Booth Point areas? I certainly think it would be beneficial to revisit Starvation Cove, Booth Point and Todd Islets. etc. I guess the point I was trying to make was that each area could benefit from multiple searches and searchers because one sees something different every time and different people notice or perceive in various ways leading to fuller and more detailed explanations or ideas. In the planned exhibition of Franklin relics in Britain and Canada next year, what would you regard as the most significant, in terms of helping the public understand the significance of the demise of Franklin's expedition. It seems to me that people have expounded on the significance of the expedition’s demise in poetry, song and scholarly articles for over a century. What is the significance of a well-outfitted expedition failing spectacularly and mysteriously? What is the significance for us today? Perhaps, it is not the artifacts that will help us to understand but exploring the human psyche may provide clues to this fascination. Having said that, those artifacts which are concerned with the minutiae of daily life and the operation of a nineteenth-century sailing vessel would be interesting to the general public. Is there any artifact in particular that spoke to you? The artifacts that spoke most to me were the ones that individuals would have worn and used, like the purple lens for snow goggles and the boot heel with the tacks. Also, the illuminators are interesting, such as the ones that were recovered from the Erebus. I have often wondered what it is like to stand at those locations and look around and let the mind wander back in time and contemplate the what ifs of history. Interesting to read of someone trained to not only do this but to interpret it in a far better context than I. Whose are the Franklin relics?